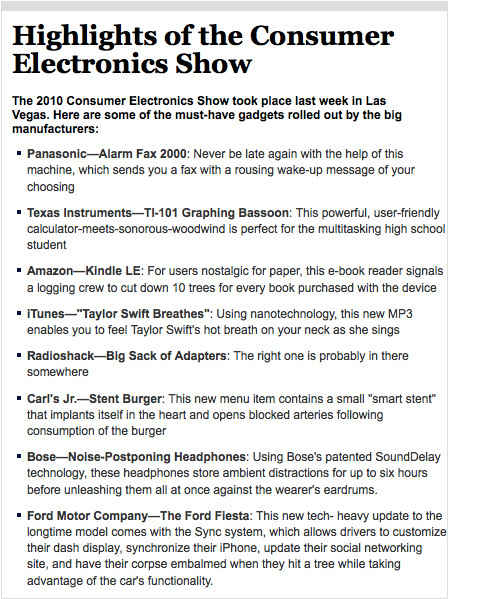 It’s impossible for any single news organization to cover everything shown at CES, but thankfully The Onion has distilled the show down to a brief highlight list covering some of the more important reveals and announcements made this year. And oddly enough, RCA’s Airnergy Charger almost seems like it belongs on this list too. PC gamers such as myself are always big on customizing our keyboards and mice. Generally that means mapping keys to specific functions and adjusting the sensitivity of the mouse. However, when given the ability, we love to take the customization to a higher level. In the past we’ve seen mice that have adjustable weights, which can make a difference. However, Mad Catz has raised the bar when it comes to mouse customization with their new line of Cyborg R.A.T. mice. 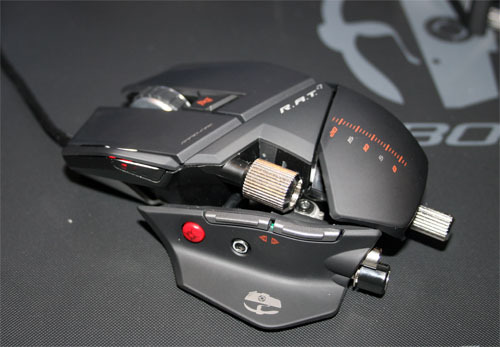 The Cyborg R.A.T mouse is one of the craziest looking peripherals that I’ve seen. At first glance, it does not look like something that would be comfortable at all. However, after placing my hand on it, I found it to be exactly the opposite. In fact, thanks to the unique features it can become one of the most comfortable mice on the market. There was a time not all that long ago where Mad Catz was a brand associated with cheap gaming accessories that no one really cared all that much about. After the acquisition of Saitek, the company really turned things around. I had the pleasure of checking out their latest line of products, each one a quality piece of hardware. In fact, the first one I’m going to show you isn’t even related to gaming. We’ve seen a number of solutions for controlling your living room PC and Mad Catz has their own. Under the Eclipse brand, the new litetouch keyboard is a sleek peripheral that wouldn’t look bad at all sitting on your coffee table. It’s a little smaller than your average desktop keyboard, thanks to the F-keys being dropped down and the arrow keys (and a few others) being brought in to the left of where they’d normally sit. If it’s going to be sitting out, smaller is generally better. These days buying music and putting it on your MP3 player of choice is a pretty simple task. Unfortunately for some of the older generation, even that can seem like a daunting task. Instead they’d perhaps just prefer to listen to the radio. Well if you’re looking to bring them into the age of MP3 players without scaring them too much, here is an interesting device that I saw while roaming the floor of CES. 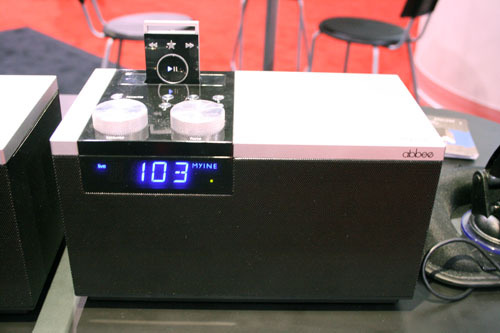 Myine has created a rather curious radio called the Abbee, which is essentially used to record music. At its very basics, it is your average FM radio that your parents and grandparents have used for years. The interesting thing is the small MP3 player docked on top of the unit. When you turn on the radio and hit the record button, that MP3 player will begin recording the music played (while automatically editing out the commercials and DJ talk). 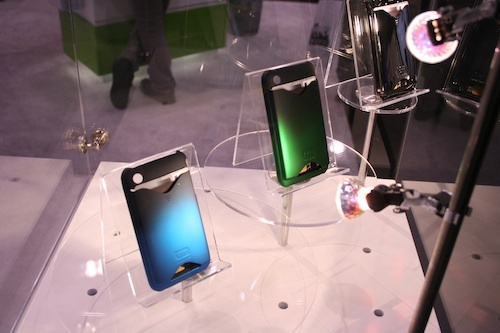 iPhone cases were everywhere at CES this year. You couldn’t go past more than a few booths without someone showing off their latest designs. Most cases were similar to others on the market, but with a different pattern, or a slightly different feel. It was always a refreshment to see something that actually brought something new to the world of iPhone cases. One in particular from Case-Mate caught my eye as I was exploring their booth. Here in Vegas there is little reason to carry around a bulky wallet. I don’t need all of the stupid club cards that you have to swipe at the grocery store and whatnot. I just need my ID, debit card and room key. Those, along with my iPhone are really the only essentials that I need on my person. Wouldn’t it be great if there were a case that could hold all of them? Well Case-Mate thinks so too. Their iPhone ID Credit Card Cases are meant to hold your phone and two credit card-sized items. I think that three might have been a better choice, but then again I rarely have to worry about a room key. For $30 you can leave your wallet at home, while still having the essentials. If you have an iPhone, it probably goes with you everywhere. But how many places do you take a cable to charge it? Since the iPhone is notorious for having less than spectacular battery life, it’s generally good to have a way to get extra juice to it when needed. 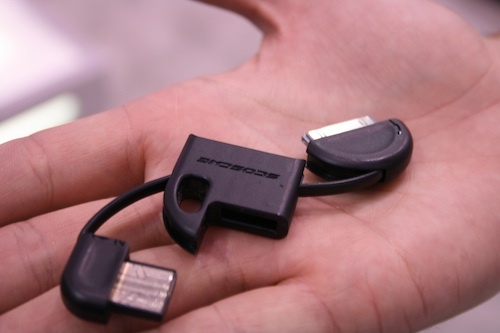 Scosche was showing off their latest iPhone/iPod charge and sync cable at CES, which should be easy to keep on your person at all times. The flipSYNC looks very much like an ordinary fob that you might have on your keychain. However, hidden within are two ends of a cable. One end for your iPhone/iPod and one that is an ordinary USB plug. As long as you have access to a free USB port, you’ll always have a way to charge and sync your device. These should be hitting the market soon for an undetermined price. Flip took an early lead in the compact & dead-easy-to-use camcorder market, but a lot of companies, including Creative, have caught up and even surpassed what the Flip is capable of with their own products. 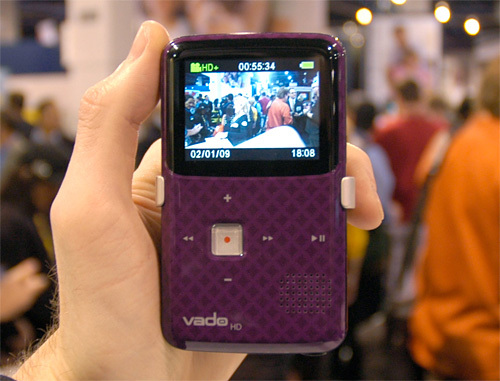 The latest version of their Vado HD camcorder features a vastly improved and sleeker design that comes in various colors, patterns and finishes that will definitely appeal to the average consumer. 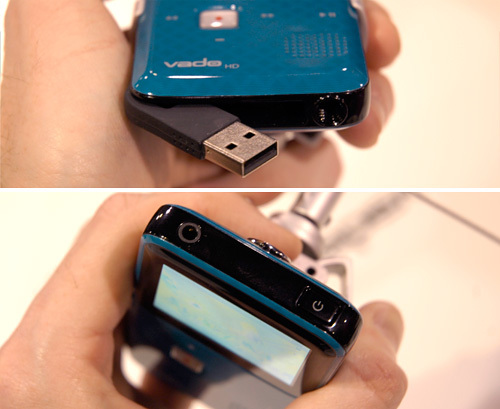 But the Vado HD will also appeal to those who care more about functionality than flash. It captures video at 720P ‘HD’ which equates to about 2 hours of footage on it’s 4GB of built-in memory. It’s also got a standard-sized HDMI port (since requiring an uncommon HDMI to mini-HDMI cable is lame) and a swing out USB connection with a flexible rubber arm with I find more convenient to use. But anyone who uses a device like the Flip for interviews will appreciate the Vado’s audio port on top which can either accept a pair of headphones, or an external microphone for improved audio quality. $179.99 available sometime this year. With the iPhone mounted in the ‘cradle’ the iType reminds me a lot of Epson’s old HX20 portable computer, but slightly more functional. And I say slightly because thanks to Apple’s restricted SDK the iType can only be used with a custom app from Ion Audio. Not the iPhone’s native applications. So anything you’ve written or intend to write has to be copied and pasted into the app you need it, which is unfortunately a big drawback to the device. 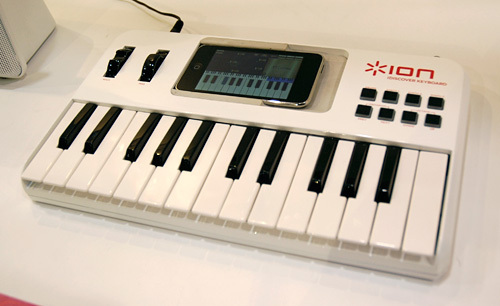 The iDiscover Keyboard is essentially the same idea as the iType, but instead of providing a QWERTY keyboard you get a set of 25 piano keys in which to compose your mobile opus. 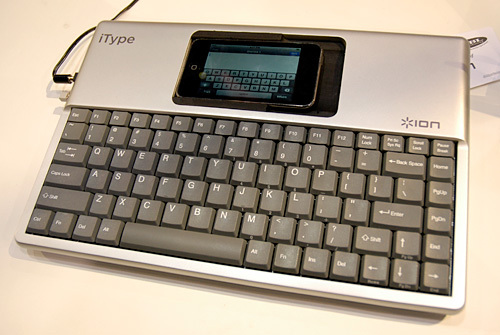 Like with the iType it works exclusively with the company’s iDiscover Keyboard iPhone app, but it does include audio out connections and a headphone jack and can apparently even double as a MIDI controller for your PC. Google Maps and its street view functionality is pretty slick, no question there, but a little competition never hurt anyone. 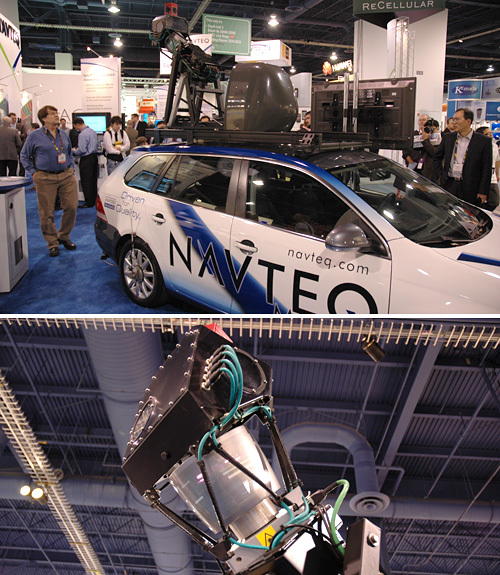 So Nokia’s NAVTEQ is raising the stakes with its new fleet of LIDAR (light detection and ranging) and camera equipped vehicles which have spent the last year roaming the U.S. capturing 3D point cloud data of America’s highways and biways. 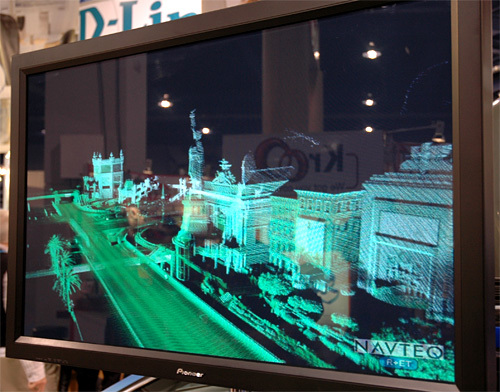 NAVTEQ True, which is what the company officially calls the new mapping collection system, is able to capture over 1.5 million 3D data points every second, from a range of about 120 meters around the vehicle. This includes items like street and speed signs, or objects as small as mile markers, but also provides data on the height of bridges or lane widths accurate to within a centimeter. What’s even cooler is that the system can be mounted to Segways, allowing the insides of buildings or malls to be mapped as well.